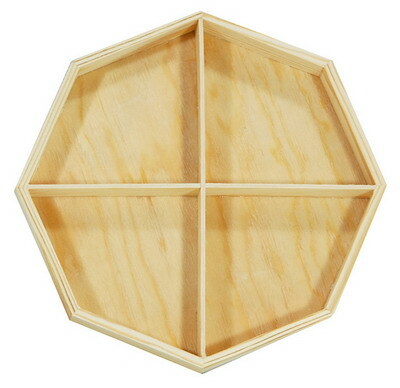 This Octagon shaped Balsam wood tray measures 7.25" from corner to corner, 1" high. It is divided into 4 sections. It is available in natural only. This item also comes in other shapes and divisions. Please click item number F0325, item number F0326, item number F0327, or item number F0328 to view these items. Get 5% discount off the regular prices when ordering a full case. Colors can be mixed to make the case quantity. If we do not have enough in stock, you can reserve the coming quantity by placing your order now. In general, this coming quantity should be available in 30 to 90 days. We will contact you for the precise arriving date. If the in stock quantity and the coming quantity together are not enough for you, place your order now and we will delivery in 120 days. Please do not go down further. Our service provider has changed the platform. We are not able to receive on line order. Please call us at (909)599-5500, or email your order to us at inquiry@coedru.com. If you are interested in quantity purchasing, click here to use our Direct Import prices. Send mail to inquiry@coedru.com with questions or comments about this web site.